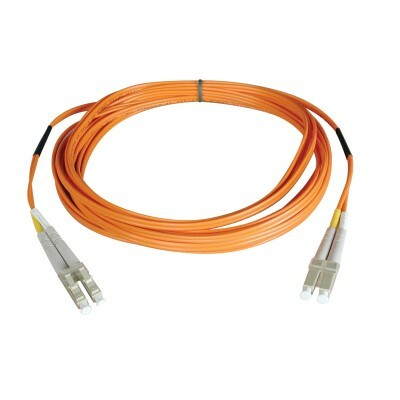 Tripp Lite's 1-meter multimode duplex Fibre Channel optic LC/LC patch cable is manufactured from 50/125 zipcord fiber. The cable has LC connectors on each end. It has a PVC jacket and is FDDI and OFNR rated. 50/125 Duplex multimode fiber is most commonly used in Fibre Channel applications. It is backward compatible with 62.5 micron fiber and provides built-in headroom for future applications. The cable provides higher bandwidth optimized for Gigabit and 10Gbps networks as well. Also available in lengths up to 152 meters. Enter "N520-" in the search field to bring up all lengths. For LC-SC cables, search "N516-", and for SC-SC, search "N506-".